You would be really surprised how dirty a 10 lb Doxie can get. After 12 years of hiking and walking in the rain with a Doxie, I am still surprised. I swear it’s their paddle feet that flip mud and dirt on their bellies when they walk. I didn’t care so much about my old car getting dirty but I bought a brand new car two years ago and started caring. If you look at my car windows, it’s obvious I am a dog owner but I didn’t want the whole car to go to the dogs. I didn’t want it trashed. The new car I bought has leather seats. I was really set against them but that’s all that was on the lot and that I could get a good deal on. Now I am so thankful that the seats don’t soak up water like my old cloth seats did. I have a new problem now though. I have to be careful to not get mud on the seats that can grind into the leather and ruin it. Over the years I have perfected a routine to clean the dogs off before I put them in the car. I dry them off once with a towel, use a dog grooming wipe to “wash” stubborn dirt off, and then dry them off again with the towel. I cover the back seat with blankets and/or towels to catch any extra dampness or dirt and then wash them when I get home. I carry a kit in the car that has these things in it but it also has some bonus items to help protect my car from muddy paws. 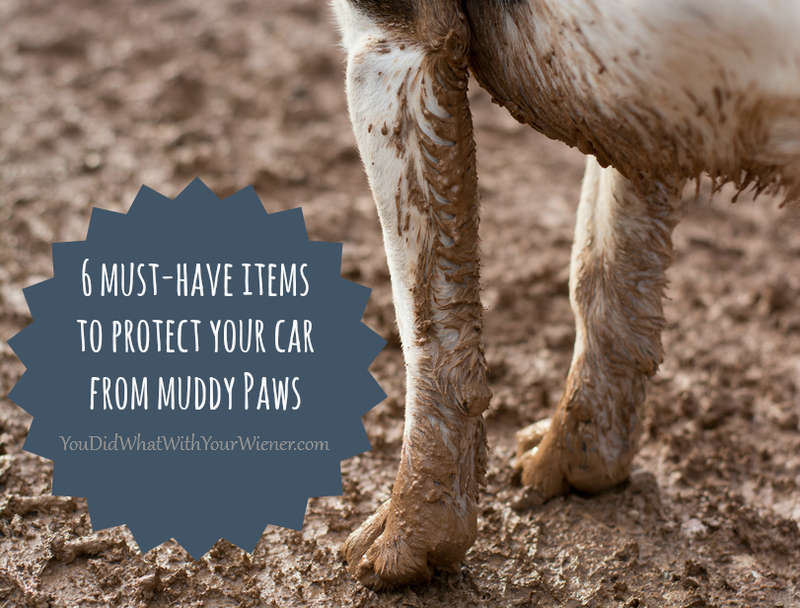 For more, check out my list of 6 must-have items to help protect your car from muddy dogs. That’s a great list that our peeps would agree with but there’s no way we are putting on booties! BOL! Chester and Gretel refuse too. I tried several times but , besides the fact that they hate them, it’s really hard to find boots that will fit and stay on twisty Doxie feet while hiking. I have but they don’t last long on rocky trails. Besides, Chester and Gretel refuse to wear any kind of boots. Interesting to know that big dogs get their belly really muddy too. I thought it might be less of a problem because they are higher off of the ground. Doggie boots are a great idea, although, I feel as though my pit bull walks unnaturally in them. It out and invested in a few things to protect my car: Clix seat belt harness, one of those car seat covers that cover the whole back seat, and weather tech floor mats. All of these have helped with keeping mud out of the car as well as keeping my Pit Bull Safe and Healthy. Please feel free to check out my website linked above as I put a lot of time and effort in my posts. Thanks everybody! We deal with muddy paws and a wet dog a lot. I would be lost without those super-absorbent micro fiber towels for when we’re at the beach. Great list! I am so glad I stumbled upon this website! My boyfriend and I have a dachshund who LOVES to hike. From small hikes to 14ers. We always wonder if there are good backpacks to carry him in though. I have looked but he won’t fit in any of the ones I have found. Do you know of any good ones out there or can you tell me what you use for your dogs? We hiked a 14er recently and worry about him going down the boulders on the way back. We tried to put him in my boyfriends backpacking pack and left a little opening for him to look out of and he was so determined to get out and hike that he jumped right out of the pack and landed on his back(!!!!). He is fine but I just hate it. I know he loves hiking 14ers and I don’t want to keep him from it. I just want to be safe. Any pointers would be great. Thanks! And again awesome website! Hi Crystal. I’m glad you found my blog.